They don’t do the hearts, but they’re still tasty. Each week in our Arabic classes, we take on a different theme pertaining to Egyptian society or culture. Unfortunately, the discussions branching from these themes are often depressing. In a country that has a 20-25% unemployment rate, a weak economy still recovering from the revolution, strained gender relations, rampant urbanization with insufficient accommodation capabilities , deteriorating environmental conditions, an exploding population set to double by 2025, an increasingly tense religious atmosphere, rapidly disappearing natural resources including water, border skirmishes with Israel, a broken political system and growing disillusionment with the political process, skyrocketing food prices, a 20% poverty rate and 40% adult illiteracy rate, and an egregious gap between the rich and the poor (not as egregious as the one in the United States), sometimes it’s hard to find something pleasant to talk about. On that note, I’d like to discuss the cappuccino situation at the American University of Cairo: Tahrir Campus. It is fantastic. For only 8 EGP (about $1.20), you can get a delicious espresso drink that is easily just as good as the ones found at nearby Cilantro, Beanos, and Costa Coffee, all of which will set you back at least 15 EGP. Though the cappuccino I bought yesterday was not as good as the one I purchased on Monday, I have high hopes for the drink I might be purchasing today. And this hope will persevere. I have tasted the foamy, cinnamon sprinkled froth of AUC Tahrir’s espresso machine and I will never forget the sensation of perfect harmony that seeped through my veins upon contact with the exotic elixir. Nay, though our theme next week be prison literature, or the one after that infanticide, still will the hope churn in my belly for the sweet 45 minute break I have at 10 o’clock, during which I might escape, if just for a moment, from the ever oppressive reality and bury myself in the delightful embrace of the one thing that has never let me down: spending money on coffee in order to lift my spirits. 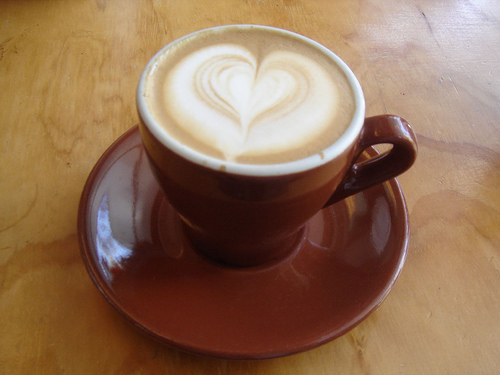 The daily cappuccino is the very least that you can do for yourself considering all else around you. You are an adventurous soul. Can’t get enough of those cappuccino adventures! That’s a bold use of the plural there; I hope you don’t get too much grief for it. No flak so far….we’ll have to see though. The blogosphere can be ruthless.